Ritually placed in once dry cavern, Mexico skeleton offers clues to first Americans. 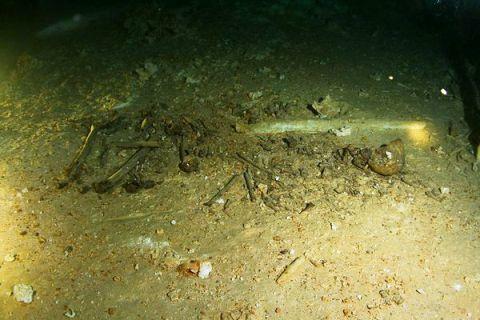 Apparently laid to rest more than 10,000 years ago in a fiery ritual, one of the oldest skeletons in the Americas has been retrieved from an undersea cave along Mexico's Yucatán Peninsula, researchers say. Dating to a time when the now lush region was a near desert, the "Young Man of Chan Hol" may help uncover how the first Americans arrived—and who they were. About 80 miles (130 kilometers) south of Cancún, the cave system of Chan Hol—"little hole" in a Maya language—is like a deep gouge into the Caribbean coast. In 2006, after entering the cave's opening, about 30 feet (10 meters) underwater, German cave divers swam more than 1,800 feet (550 meters) through dark tunnels spiked with rock formations. There they accidentally uncovered the Ice Age human's remains and notified archaeologists based in the surrounding state, Quintana Roo. For the last three years researchers led by Arturo González, director of the Desert Museum in Saltillo, Mexico, have been studying and documenting the bones in place, so as not to lose any clues offered by context. In late August scuba-diving researchers finally raised the bones for lab study, after having placed them in plastic bags of cave water and sealing the remains in place. No fewer than 10,000 years ago, Chan Hol filled with seawater as Ice Age ice caps melted, the researchers say. No human, they conclude, could have ended up so far back in the cave system after that point—which is why they believe the young man is at least 10,000 years old. The exact age of the bones should be determined by ongoing carbon-dating tests, which should be completed in three to four months, Gonzalez said. The newly raised skeleton is the fourth to be found in underwater caves around the town of Tulum. One of the other skeletons—named the Woman of Naharon, or Eve of Naharon—is thought to be even more ancient, around 12,000 years old. At about 60 percent complete, the Young Man of Chan Hol skeleton is remarkably whole for a 10,000-year-old specimen, the researchers say. Especially revealing are his teeth—lack of wear tipped off the team to the individual's relatively young age at death. For now, the bones have been sealed in a special chamber for the next six months to a year to dry out and to allow time for their minerals to harden, making the remains less fragile. Afterward, the bones will be scanned to create 3-D computer models that can be compared with the bones of other ancient Native American remains, project leader Gonzalez said. The skeletons found in the Quintana Roo caves could force scientists to rethink their ideas about the initial population of the Americas, Gonzalez said. For example, the skulls of both the Young Man of Chan Hol and the Woman of Naharon have anatomical features that suggest their owners were descended from people of South Asia and Indonesia—not from northern Asia, like North America's other known early migrants. The discovery supports the idea that multiple groups of migrants may have entered North America via the Bering Strait—using the now submerged land bridge that once connected what are now Siberia and Alaska—at different times in history, Gonzalez said. Today, the Yucatán Peninsula is covered by rain forests, but when the Young Man of Chan Hol lived, it was a semiarid savannah, said Wolfgang Stinnesbeck, a geologist at Heidelberg University in Germany, who was not involved in the research. "The Yucatán surface was dry, and there were no rivers or lakes on the surface," Stinnesbeck said in an email. Finding water and shade would have been a problem, and as a result humans may have found refuge and drinking water in subterranean caves, he added. The caves may have also served a spiritual purpose, project leader Gonzales said. The skeleton, he noted, was found in an unusual position—on its side, with legs bent and arms held straight along the sides of the body—suggesting the man had been purposely placed in the cave, perhaps as part of a funeral process. "At the moment we do not know the cause of death, but considering the articulated position in which we found him, we think he was placed at this location," Gonzalez said. The team also found evidence of bonfires inside the cavern, which could suggest that illuminating the cave was a part of the funeral ceremony, he added. The cavern where the body was found may have been chosen as the young man's final resting place due to its rich trove of stalactites and stalagmites—rocky cones that hang from the ceiling and thrust up from the ground, respectively. "Next to his head are a group of stalagmites that could have evoked a special resting place," Gonzalez said, "or perhaps the place to begin a journey after death." The Young Man of Chan Hol lies in a Mexican undersea cave before the bones' removal last month.